Food 4 Thought - Issue # 6 - Pitchfork Cheddar | Blog | Di Bruno Bros.
There’s a new cheddar on the market, and it’s important that you care. This isn’t ubiquitous block cheddar, snuggling comfortably next to a dozen similar options on the shelves at your mega grocery store. This is Pitchfork, a clothbound, raw milk, handmade homage to the very provenance of cheddar. And if its makers had listened to reason, it wouldn’t exist. The Trethowan brothers made their presence known to the cheese world in 1996, when they first started making Caerphilly in Ceredigion, Wales. Todd, who got his start behind the counter of famed London cheese retailer Neal’s Yard Dairy, learned the craft from Chris Duckett, the last remaining descendant of a family of Somerset Caerphilly producers. He set up cheese-making equipment on his parents’ farm and started making cheese with the local milk. Shortly thereafter, he was joined by his brother, Maugan, and sister in-law, Kim. The trio were hailed for their efforts in sustaining the legacy of farmstead Caerphilly. Their version, named Gorwydd (pronounced GORE-with), was soon recognized as the benchmark of the style. But they were not content. In 2014, they toured England in search of the best possible grasslands for their cattle. 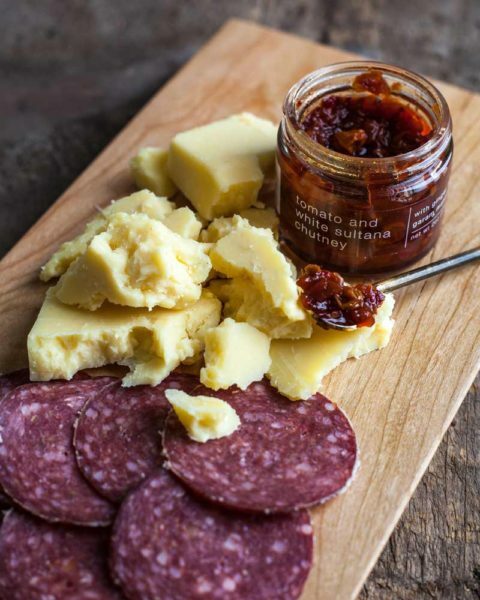 As fate would have it, they settled in Somerset, England, not far from where Chris Duckett was making cheese, and only five miles from the town of Cheddar. After several years of reestablishing production on Gorwydd, the yen began. The reason their consultants were against this move is because it runs inverse to the traditional cash flow strategy for cheesemakers. Traditional British cheddar typically comes in 55 pound wheels and is aged for at least a year. That’s a lot of milking going into a lot of cheese ageing for a long period of time. 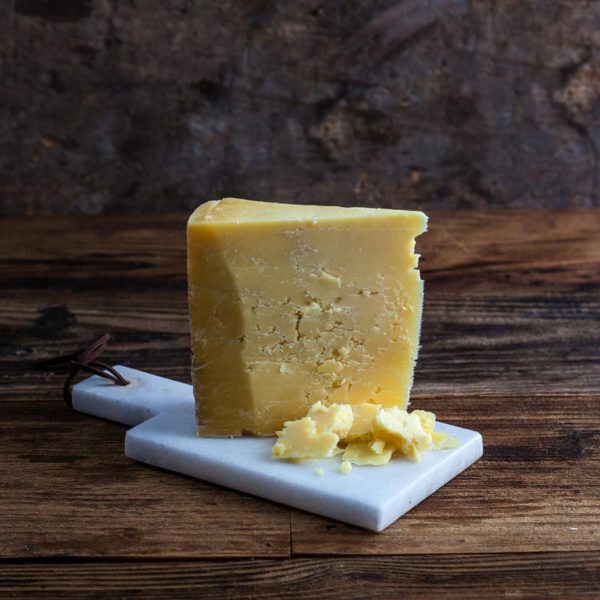 Historically, producers of cheddar would also make Caerphilly or Cheshire, smaller wheels that could be sold in three or four months, in order to turn milk into money more expeditiously. The Trethowan’s already had that model in place. Dedicating their liquid assets (in this case, literally liquid milk) to the production of a new cheese could prove detrimental. There are more, but you get the idea. Traditional cheddar-making is time-consuming, laborious and expensive. Even with industry support, there will be trial-and-error, waste and loss. Further compounding matters, there are already three established producers of ASC dominating the market: Montgomery’s, Keen’s and Westcombe. Undeterred, the Trethowans made their first batch of cheddar early in 2018. They allocated two days’ worth of milk per week towards the new venture, producing only three or four wheels a day. In a show of curd fraternity, the team at Westcombe allowed them to age their early wheels in the Westcombe ageing room until the brothers could build their own space. Within a year, Todd and Maugan were making 12 wheels per day, were storing their own inventory, and had officially named their cheese: Pitchfork Cheddar. The brothers, thus far, have proved the doubters wrong. The first 120 wheels were released to Neal’s Yard Dairy in December. In January, we agreed to take half of those in exchange for being the exclusive retailer in the United States. Our first wheels landed last week, and they are nothing short of delightful. In contrast to the long-established producers of ASC, Pitchfork is creamy, buttery and juicy, with a hint of bite in the finish. 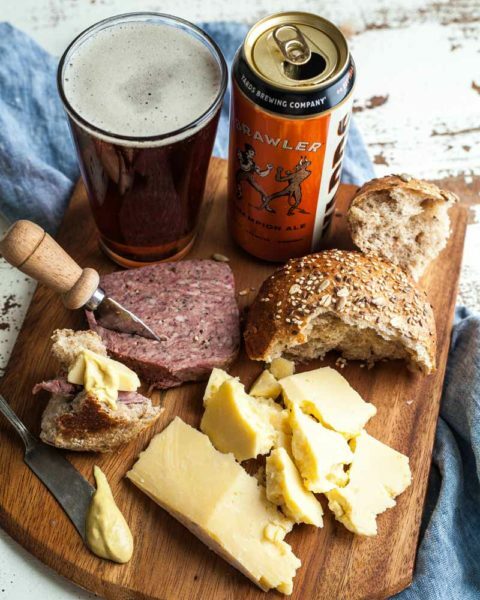 It is the perfect addition to a farmhouse platter, alongside paté, mustard, a room-temperature ale and hearty bread. 1) Pitchfork has applied to the Slow Food Presidium and is expected to be approved as the fourth Artisan Somerset Cheddar in September. 3) The Trethowans tend a herd of 130 cows, predominately Holstein with some Jersey mixed in. 4) In our March Cheese Madness competition this year, Pitchfork beat perennial favorite Delice de Bourgogne in the first round. 6) Todd and Maugan will be in Philadelphia for our annual Legends Event on June 20th. Be sure to ordBlack Garlic Molasseser tickets to meet them – and about 15 other cheese makers – soon. Hunter is a Di Bruno lifer. For as long as he can remember, his mom brought him into the cramped, aromatic Italian Market location as a weekly ritual. Before graduating high school, he was working behind the counter, slicing prosciutto, and making the famed cheese spreads in twenty pound batches. He now serves as head cheese monger, and he has had the distinct pleasure of traveling the world with Emilio, honing his palate over countless dinners, trainings, and trade shows. In Food 4 Thought, Hunter’s mission is to share our favorite discoveries while addressing the impact they have beyond the culinary world. We believe that the best foods have a story to tell. They’re crafted with consciousness; they honor the past with an eye towards the future. These are the products we’re most proud to have on our shelves, and the producers we’re most passionate about supporting. Please comment on the blog. Come talk to a monger. Cook for friends and family. Come join the conversation!